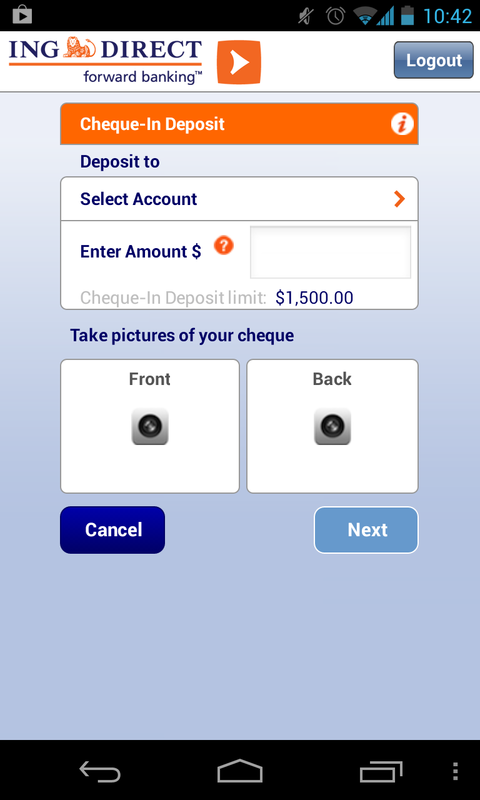 ING Direct introduces mobile deposit! As you all know I am an ING Direct customer, I have their banking application on my mobile phone. Today, I found out their cool feature of mobile deposit. I decided to login to check it out for myself. But I couldn’t find the new “deposit” feature on the bottom tabs. A light bulb clicked, I haven’t updated my ING Direct app yet! So I scooted over to my play store apps to update the newest version for ING Direct. Voila, I am now able to snap pics of my cheque to make a deposit! Step 5: After ING Direct reviews your cheque, they will approve it or not. Once approved, you can destroy your cheque. Hmm, looks like I’ll still have to deposit my monthly pay cheque at the ABM. At least, I have a credit union across the street from my work. PHEW! Canadian banks are slow to act while other countries in the world have already adopted mobile cheque deposits as a daily occurrence. Finally, ING Direct has joined the new wave of internet banking making it easier for Canadian customers to make a deposit without stepping foot into the bank. However, there is a limit to the amount of money you can make a deposit with. Anything over $1500, you would have to go to the bank physically to deposit the cheque at the ABM or bank teller. Otherwise, you are free to snap pictures of your cheque and make a deposit directly into your bank account in your PJs. UPDATE: My mobile deposit limit is now $25,000! My overall stocks are a little depressed at the moment. >_< It really doesn’t affect my monthly warriors from churning out distributions time after time! For the month of October, I’ve collected $292.14 in distributions. YTD: $3001.65 total from distributions and dividends. Next year, I plan on increasing my collection to $5000! To earn interest on your savings these days are hard to come by. With good no fee, high interest saving/chequing accounts alike, you can make the most out of it. I usually leave little to no money in my chequing account (0.25% from ING Direct), yet I’ve managed to earn 12 cents on the money that got leftover in my account! Really beats having to pay a monthly to your big five banks! Don’t you think? My Orange Key is: 16537317S1 please use my referral and we can both benefit from it, thanks! Earlier in the year, TD Bank bought out the Canadian division of MBNA. With this new ownership, the awesome reward system that was currently being offered is now being slashed by greedy TD Bank. I dislike banks with a vengeance for changing the rates. Why can’t they just honor the terms that was first agreed in the first place? Now, I am worried about Scotia Bank who has bought out my free online banking at ING Direct. Will they also implement a fee to squeeze out more profit from their customers? 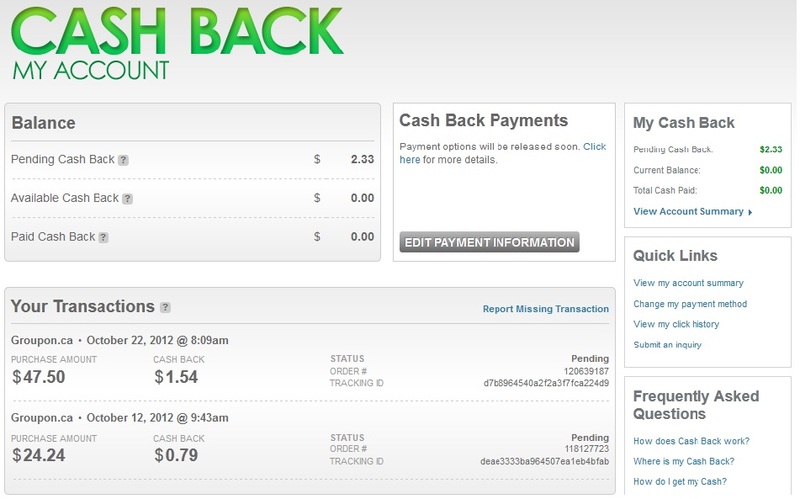 On a positive note: I earned $2.33 so far from my Redflagdeal Cash Back account. I can’t wait to get cash back for a recent purchase of a Macbook Pro for a coworker, too bad I forgot to use Redflagdeal Cash Back account for an Iphone 5 purchase through the Apple site. Let me clarify, I’ve been put in charge using company’s credit card for buying Christmas gifts online for a set monetary bonus limit for other coworkers. I just use it to my advantage ^_^ Might as well right?